As a result of record-high temperatures and fuel supply constraints this summer, wholesale electricity prices in the western United States reached their highest levels since 2008. 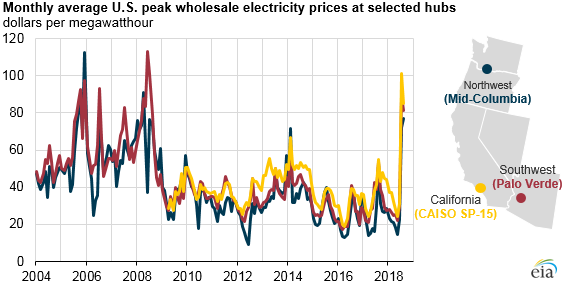 In the area served by the California Independent System Operator (CAISO), peak-period electricity prices in July averaged $101 per megawatthour (MWh), the highest monthly average since the current day-ahead market began trading in April 2009. Peak-period electricity prices at the Palo Verde trading hub in Arizona and at the Mid-Columbia hub in the Pacific Northwest averaged $89/MWh and $72/MWh, respectively, in July. Prices in each area also remained relatively high through August. 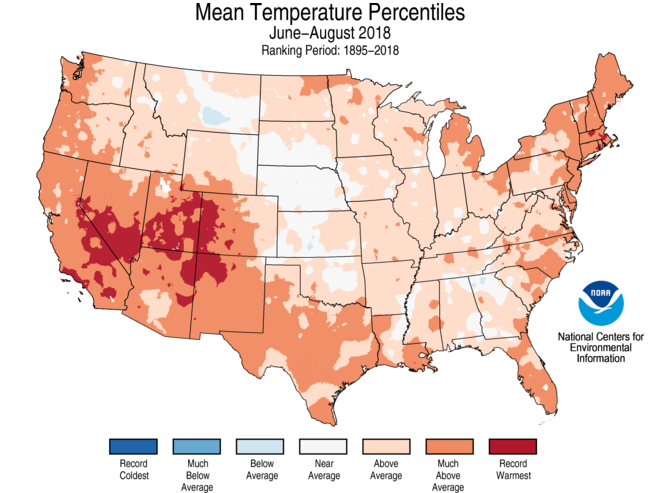 Summer 2018 temperatures were much warmer than normal in the western United States. In June, July, and August, the Portland, Oregon area experienced 29 days with temperatures higher than 90 degrees, compared with 10 days during a normal summer. California set a new record in July with a monthly statewide average temperature of 79.7 degrees, surpassing the previous record set in 1931. The hot summer temperatures led to relatively high demand for electricity. Electricity load in the western states was particularly elevated during the last week of July. On July 24 and July 25, CAISO issued a Flex Alert asking customers to set their air conditioners at 78 degrees or higher and to avoid using appliances during peak hours. Hourly electric load data collected through EIA’s U.S. Electric Operating System survey indicate that the coincident hourly load for the Western Interconnection (including the Northwest, Southwest, and California regions) peaked at 139.4 gigawatts (GW) during the evening of July 24, 2018, the highest level since EIA began compiling this data in mid-2015. The elevated electricity demand contributed to the highest wholesale prices in at least the past 10 years. Daily average electricity prices at CAISO’s SP-15 trading hub, which reflect electricity market conditions in Southern California, reached $377/MWh on July 24. Electricity prices at the Mid-Columbia hub between Oregon and Washington averaged $230/MWh that day, and prices at the Palo Verde hub in Arizona reached $291/MWh on July 25; both were the highest daily average prices since 2008. Hot weather during the second week of August again led to relatively high electricity prices at the western U.S. trading hubs, and Mid-Columbia prices reached a new high of $255/MWh on August 7. Note: Peak-period electricity prices are for Monday through Friday between the hours of 6:00 a.m. and 10:00 p.m. Many western states experienced drought conditions in recent months, which led to a decline in conventional hydroelectric output. Hydropower output in California during the first half of 2018 was slightly higher than the previous five-year average, but it was still 47% lower than generation during the same period last year. One potential mitigating factor is the growth in non-hydro renewables, particularly solar generation, which has offset much of the decline in hydro generation since last year. Another reason for the high western electricity prices this summer was a sharp increase in natural gas fuel costs, particularly in Southern California. 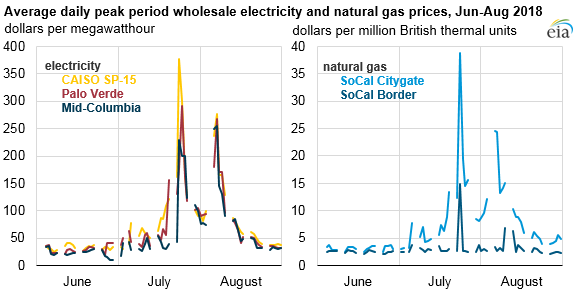 On July 24, natural gas prices at Southern California Gas Company’s (SoCal) Citygate, where natural gas enters SoCal’s local distribution system from the transmission pipeline, averaged $39 per million British thermal units (MMBtu), compared with an average price of $8/MMBtu the previous week. Prices at the SoCal Border hub, which reflect transactions at pipeline interconnects near the Arizona-California border, averaged $15/MMBtu on July 24, up from $2.90/MMBtu the previous week. On July 24, Southern California Gas Company issued a system-wide curtailment order, which indicated that some natural gas-fired electric generators may be restricted from operating on the following day. The curtailment was issued because of forecast record-high temperatures and limited fuel availability from the Aliso Canyon storage facility. However, the restrictions did not need to be implemented on July 25 because electricity load was lower than expected.